PATTERN 1833 BRIGADIER GENERAL’S DRESS UNIFORM EPAULETS – IDENTIFIED TO BRIGADIER GENERAL JOHN SHULER WILCOX – 52ND ILLINOIS VOLUNTEER INFANTRY – WOUNDED VETERAN OF CORINTH - A VERY NICE PAIR WITH BRIGHT BULLION TRIM: This set of Pattern 1833 General Officer’s Epaulets has not only survived as a matched pair – a remarkable feat in and of itself, but this set is identified to Brigadier General John Shuler Wilcox who served as the commanding officer of the 52ND Illinois Volunteer Infantry and was wounded during the Civil War at Corinth. 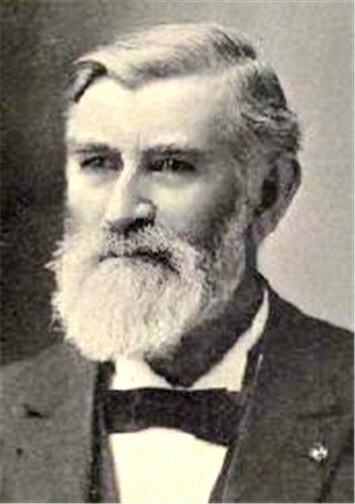 John Shuler Wilcox was born in 1833 into a family with a well established record of military service to the United States – his grandfather having served as a officer during the Revolutionary War, and both his grandfather and father having attained the rank of General in the New York State Militia. The Wilcox family moved to Kane County, Illinois near Elgin in 1842 and John experienced a childhood typical of most boys living on the frontier. Having attended some formal classes at Lombard University, and studied the law in the offices of his brother, Wilcox was admitted to the Illinois Bar in 1855. Wilcox enlisted in a militia company, the Washington Continental Artillery, when it was organized in Elgin ca. 1856. He served in this militia company until July 27, 1861 when he signed the rolls of Company K, when the 52ND Illinois Volunteer Infantry Regiment was mustered at Camp Lyon, Geneva, Illinois. On September 14, 1861 Wilcox was recorded as a Captain. As the 52ND – known as the “Lincoln Regiment” - was organized and prepared for entry into the Civil War, Wilcox was promoted to Lieutenant Colonel. Following the Battle of Corinth, Wilcox assumed command of the regiment and in May of 1863 he was promoted to the rank of Colonel. General Wilcox was with the 52ND during the Tennessee campaign in 1862 and was present at the battles of Ft. Donelson, Iuka and Corinth, Mississippi and in 1863 at Lay’s Ferry, Georgia. He received a severe head wound at Corinth which resulted in a permanent hearing loss in one ear. In the spring of 1864, Wilcox was summoned by the Governor of Illinois and the state’s Adjutant General to organize the 141ST Illinois Volunteer Infantry, consisting of the famous “100 Days Men” mustered in at Elgin, Wilcox’s home town, to support what was seen as the final push to end the war. Wilcox remained on duty through the end of the war and was promoted to Brigadier General of Volunteers in March of 1865. After the war he returned to his law practice, and in the following years he was elected mayor of Elgin, was appointed postmaster, served as a director of the local bank, on the board of the local library, on the board of trustees for Elgin Academy, and eventually owned a fuel and warehouse business having left his law practice due to his loss of hearing. He was a member of the Grand Army of the Republic, The Loyal Legion, and the Society of the Army of the Tennessee. In 1916 Gen. Wilcox made his home with one of his daughters in Los Angeles, California and it was there he died in 1926 at the age of 93. He was interred at the Bluff City Cemetery in Elgin, Illinois. When I purchased this set, they were contained in a glass front deep frame that had definitely seen better days. As the frame was not providing significant protection for the items, it did nothing to enhance the appearance of the set, and in consideration of the risks involved when shipping glass – the possible damage to the epaulets if the glass were to shatter in transit - I removed the pieces from the frame. It was very apparent that the set had been together for a very long time, and given the accuracy of the information on the slip of paper as it reflects the general’s Civil War service, I have no doubt the identifying paper is original to the grouping and accurately identifies the epaulets and button to General Wilcox. Based on the inscription on the piece of paper that accompanied the epaulets, I suspect the General presented them with the button from his uniform to a family member or friend on Christmas of 1914. He was 81 at the time, was two years from moving into his daughter’s home in California, and was very likely at that stage in his life where he was beginning to pare down his possessions. Other than he made of gift of the set, I can find no other significance to the date on the slip of paper. Of the pattern introduced in 1833 which remained the style of general officer’s epaulets until 1872, this pair of Brigadier General’s Dress Uniform Epaulets has survived in very nice condition with bright brocade and bullion trim. The epaulets measure 7 ¼” long and 4 ½” wide at the width of the swell, with 2 ½” long fringe. The top surface of the epaulet features a surface of gold brocade cloth edged with a roll of embroidered gold bullion cord. The swell at the outside end of the epaulet is framed with a brass crescent edged with a bead of jaceron. From the edge of the swell depends a fringe of 1/8” in diameter twisted gold bullion cords. The rank of brigadier general is indicated with an embroidered silver bullion star in the center of the crescent, measuring 1 ½” across the points, and standing ½” proud of the brocade base. All of the insignia, trim and fringe is in very good condition, showing very little evidence of wear and only the slightest tarnishing, with an overall bright, shiny appearance. There is some minor loss of the metallic fringe with one or two pieces missing from the points where the fringe ended at the points of the crescents, however the loss is not particularly noticeable given the location. The underside of the epaulet features a tailored cloth pillow that fit around the radius of the officer’s shoulder, made of white or yellow polished cotton cloth. The cloth shows some wear and aging with some loss around the edges, none of which is apparent when the epaulets are displayed. The button is the standard General Service Infantry button and I suspect it was salvaged from the General’s uniform. The slip of paper is intact and all of the handwritten inked inscription is present and legible. The age of the paper and the aged color of the ink indicate the paper and the writing are consistent with a piece written in 1914.